Quite a lot of exciting things to talk about this morning and not so much time to write everything down! 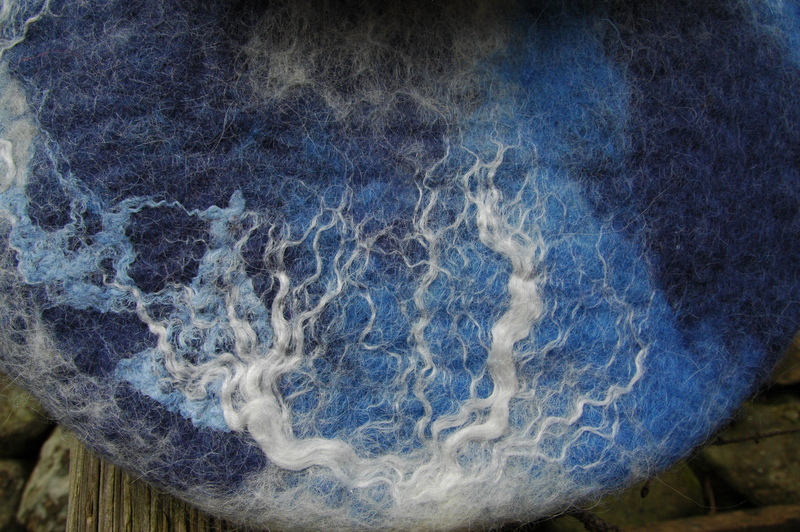 Starting with the sneak preview, here is a detailed image of the silk and corn fibres (turquoise and white respectively) that I combined with Icelandic wool for my latest felt bag. I am not going to post pictures of the completed bag yet (yay, got the handle finished and fitted this morning!!) in case my swap buddy is following here but this will give you an idea of how I interperted her favourite ocean inspired colours. Now that the bag is finished I am very happy with the sense of motion, almost wave like that the white corn fibres add to the surface. These fibres were one of the goodies that I bought last October from Blas and Jamie at Urban Fauna Studio in San Fransisco and I can’t wait until October again this year when I am making a return visit and will be facilitating a workshop as well! Blas and Jamie are making a visit to Ireland this Spring and as well as participating with me in a workshop at Clasheen I will be spending some time with them showing off some of my favourite spots here in South Eastern Ireland. That sentence leads me nicely into my biggest news, I will definitely be in America during October 2010 and would love to do a series of workshops across the States and get to meet as many of my blog followers as possible! Thanks so much to Dawn Edwards who will be organising an event in Michigan. I can’t say how thrilled I am that we will be meeting up in person at last and I actually get to stay with her and wear her out with all my chatting, how cool is that!! Over the next week I have to finish my submission for an ArtL!nks bursary, deadline for me is next Wednesday but as soon as that is done I want to chat with everyone who might be even vaugely interested in the possibility of a felting workshop so please email me if you would like to touch base and try and work something out. My plan is to either start the trip in San Francisco and end in Chicago or visa versa and I am thinking of travelling early in October but need to clarify the dates and see if I could possibly include the last week in September as well. Please email me directly if you might be interested, it would be great to hire a car and teach all the way from Chicago to San Fransisco! The Clasheen Spring Swap is now posted to our group on Flickr and sign ups are underway as we speak. For this seasonal swap we will make one special gift for our swap buddy using Spring as our inspiration. Let your imagination run wild sparked by all the freshness of the season, ideas to consider include light weight scarves, jewellery, hand painted cards, homemade floral scents or body products, fabric covered art journals, anything at all with a spring theme or colour. We will also include a couple of inexpensive extras (possibly from our stash) and a receipe for a light and appealing main course dish which we enjoy cooking ourselves at this time of year. If you want to sign up for the swap remember you need to do so through the group on Flickr, joining us is easy if you are not already a member! For those of you wondering where I got the gorgeous hand made beads that I incorporated into Suzanne’s necklace I bought them from Lori aka Tabmade on Etsy. Unfortunately Lori doesn’t have anything for sale at the moment but if you do a search for fimo or polymer clay beads on the internet maybe you will be lucky and source some unusual beads for yourself. And finally, poor Suzanne is having problems with her wrist and now has to go back for more surgery next week. Somehow the bones have shifted and her cast was removed yesterday. Now she has a back slab fitted as a temporary support and it is extremely painful so hopefully next week will start some progress and her wrist will finally stop paining her at last. Thanks for all your messages to her, I am passing them on and she appreciates the thought. This entry was posted in Felt, submissions, Swaps, workshops and tagged beads, Clasheen Crafty Swap, Clasheen Spring Swap, Felt, felt workshops, Felting, felting workshops, swap by Nicola. Bookmark the permalink. So sorry to hear about your sister being in such pain and needing additional surgery. That must have been quite a bad break. Though I know that she’s not looking forward to having another surgery, we’ll hope that this one will remedy all of those problems and that she’ll be on her way to recovery soon. Will be keeping her in my thoughts and prayers. Hope you’re having a great start to the weekend. I’m so excited to hear you’ll be coming our way…thanks Dawn for all your efforts. If you need any other “helpers” while in Michigan let me know. Hope you sisters feeling better soon. Oh, thank goodness, Kristi. Will you help me clean closets, or at least stuff all that’s overflowing in before Nicola arrives:-) It’s going to take the two of us to cram everything in…No kidding! Nicola, check the classes page of my website and you’ll see pictures of Kristi…She should be a model.